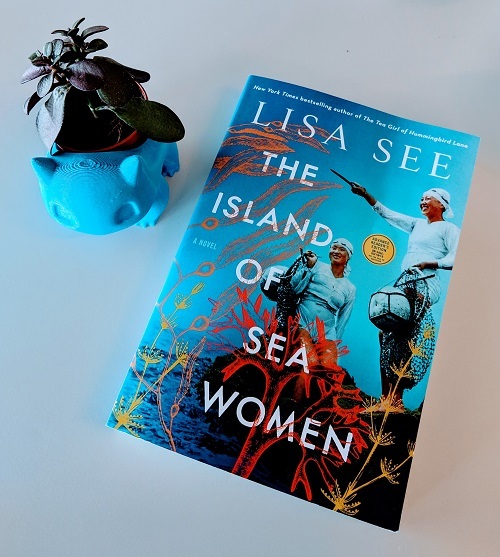 The Island of Sea Women was the first book by Lisa Sea that I’ve read, and it destroyed my heart in all the right ways. Immediately after finishing this book, I broke down crying. The story takes place over the course of roughly 50 years (if my math is right), and follows two main characters: Young-sook and Mi-ja. This novel deals with a lot of themes—friendship, loss, forgiveness, and resilience, to name a few—and was easily one of the best books I’ve read so far this year. Before I get too far into this review, I’d like to mention that I received an advance copy of this book from the Kitchener Public Library. KPL invited me to be a part of their event, An Evening With Lisa See, and interview her on stage in front of attendees. We chatted about this book, her inspiration, writing process, and more. This was an incredible opportunity, and provided me with a lot of additional insight into the novel. The Island of Sea Women takes place on Jeju, which is an island off the coast of South Korea. The novel focuses on haenyeo (female free-divers), and their rich, cultural traditions. These women dive in tight-knit collectives, and earn a living from harvesting seafood. Traditionally, they were the breadwinners of their families, and worked while their husbands took care of their homes and children. Now, the only haenyeo left are quite old, as young generations take to city jobs instead. Because of this, their culture and traditions were added to the UNESCO list of Intangible Cultural Heritage in 2016. Since the novel spans multiple decades, a lot of history is covered. From WWII to the 4.3 Uprising, Japanese occupation, and more, there is much to learn. However, all of these events are presented through the lens of the main characters. The book shifts back and forth from “present day” (2008), when Young-sook meets and speaks with American tourists on Jeju, and past events. During these long flashbacks, we see Young-sook and Mi-ja grow up. They learn how to dive, join their collective, travel during off-seasons to dive elsewhere and continue providing for their families, and eventually get married. Then, their lives change as they become mothers, but they still remain tied to the sea. Despite the harshness that life throws at them, diving is always there. Reading The Island of Sea Women feels like magic. Yes, there are some difficult topics throughout the novel, but the writing is absolutely beautiful. The author spent a lot of time conducting research, and even spent time on the island speaking to haenyeo and gathering stories about their youth. The details she includes in this book are incredible, and make you feel like you’re right there on the beach too. During the chapters set in present day, Young-sook finds herself speaking with Americans. While this isn’t abnormal—Jeju is very much a tourist destination—this particular couple and their young daughter won’t leave Young-sook alone. After a few days she realizes who they are, and that they are in fact tied to her in a way she never could have imagined. How so? Well, you’ll have to read the book to find out. I promise you won’t be disappointed!